Amersfoort- What can you say about a perfectly quaint Dutch town center surrounded by medieval walls and moats? I should do some research here and throw the reader some bones- quick quizzes, quirky historical trivia, facts on major battles, devastating fires, ravaging plagues and witch burnings, that sort of thing. Instead I’ll let the reader experience the town as we did, in near absolute ignorance- enjoying the town for its visual charm alone, early in the morn. Vrienden house #2, on Cabotstraat. Note the grass growing tall in the garden. My impression is that the Dutch, unlike their cousins the Flemish, allow for a little disarray and wildness in their surroundings. I’m not stating a preference here, but I think personally I’d find it easier to get along as a suburban resident of Amersfoort or Utrecht than, say Ghent or Antwerp, if only because the locals in Flanders might be unlikely to tolerate my less-than-precision lawn mowing. The Flemish are right up there with the Austrians in lawn and garden perfection. The streets of the neighborhood were named for the great European explorers. Through this passage we leave the Amersfoort burbs and enter an ancient world of mystery and romance! The 98m high tower of our Lady in the center of town. Not only the town center, but inside you will find a stone that marks the center point of Holland, cartographically speaking. This was the steeple of a large cathedral, where the town mayor and commander of the local regiment decided would be a good place to store gunpowder. Perhaps God thought otherwise because the church was blasted to hell in a glorious earth-shattering kaboom one day. But the tower survived! The question is, why is my font stuck on grey? Checking Tripadvisor to see if the tower was worth the entry fee, I ran across a Dutch tourist’s description of the place. Her last sentence seemed harsh and left me wondering “why the five stars if you’re just gonna crap all over the place at the end of your review?” Clicking the translate feature cleared things up. “Who is this Piet Mondrian?”, you ask? Silly philistine! He’s the guy that did those snazzy red, blue, white and yellow boxy pictures. And you thought it was Miro. Heh! Look, here’s a ditty I made up to help you remember. First come circles, Next come squares. Chillin in Amersfoort, and gettin my Mondrian on. When we got back, Mrs. Jonk was getting breakfast set. Note the carpentry tools of her father. And note the Fanta Orange. Keenan was so pleased with that the night before that she was offering it for breakfast as well- what a softy you are, Mrs. Jonk! Jonk’s late husband was a carpenter too, an amateur actually but good enough to make this boat and this living room set (see the wine rack under the fireplace? Thank you Mrs. Jonk for a great stay in a beautiful town! Next- a good day for riding! The bikes were old but solid. Jan gave me a look when he wheeled out Keenan’s bike, as if to say, “He won’t mind a lady’s frame, will he?” But I don’t think Keenan even knows- you see guys riding around on ‘lady’s’ frames all over Japan- It’s pretty standard. The plan was to ask for a good bike route to our next destination, Amersfoort, but the crowds at the tourist office were so large that I decided to wing it and get on the road- How hard could it be to find Amersfoort? Then he repeated himself and added, “Today there is a level 9 storm hitting the country and it’s too dangerous to ride. Don’t do it! That’s the best advice I can give you. There’s a station right down the road here and you can take the train, if they are running. Good luck! Here is someone who wasn’t opposed to riding out the storm in comfort and ease. When we arrived on Amersfoort, the rains had kicked in full blast, and after the fifteen minute ride to the Friends of the Bike house we were cold and soaked, but happy to reach shelter and relieved that we didn’t have to ride through four hours of this stormy weather. We washed up and came Barack downstairs where Mrs. Jonk had hot chicken soup Waiting for u son the coffee table in the living room. While we were warming up, watching the Tour de France on the TV, another guest pulled in. There was animated discussion at the entry and then the new guest came to sit down with us in the living room. Gwendonlyn had ridden all the way from Den Haag (The Hague). K, D and hard-charging Gwendolyn. We all chatted for a while, then the race ended and Keenan and I headed into town for a burger and frittes. So we took a short ride from Leylylan station to the Vondel Park. After the park, we hoofed it back to the house. and took our breakfast at the corner dining table. We have arrived in Amsterdam after a car ride (Hamamatsu to Nagoya), 3 flights (Nagoya-Narita, Nrt-Helsinki, Hels.-Amst. ), a train ride (Schippol-Amst. ), and a walk to our Vrienden op de Fiets (Friends of the Bicycle) homestay apartment. 22 hours from door to door, but still considerably easier than my first day with Una last year, getting to our place in Ypres, a forty-hour ordeal. Weary from jet-lag and the inflight movie marathon, it takes Keenan 2.3 milliseconds to conk out on the Helsinki airport floor. …but he perked right up when I rousted him for our last leg to Holland. Such was his excitement that after I asked him to turn around for a pose and brought the camera back up to my face he had bolted ahead and disappeared into Finnair. Without a cell phone in Europe, I’m going to be communicating via email and skype. I found a wifi spot and called Mr. de Vries via skype and let him know we’d be coming. He was waiting at the platform at Lelylan station but we went straight for the exits and missed him. After waiting a while, we got help from some friendly locals and went in search of the deVries’ place. Just after we found the place ol’ deVries coasted in on his bicycle. He welcomed us in, we showered up and headed out for a bite to eat and a tour of the neighborhood. It was 8:30 by the time we sat down for chow at a turkish fast food place, but still plenty light out. If I open a supermarket in the States it will be called Daniel William Shumway. …Hey. Is that??.. Aha! It is! 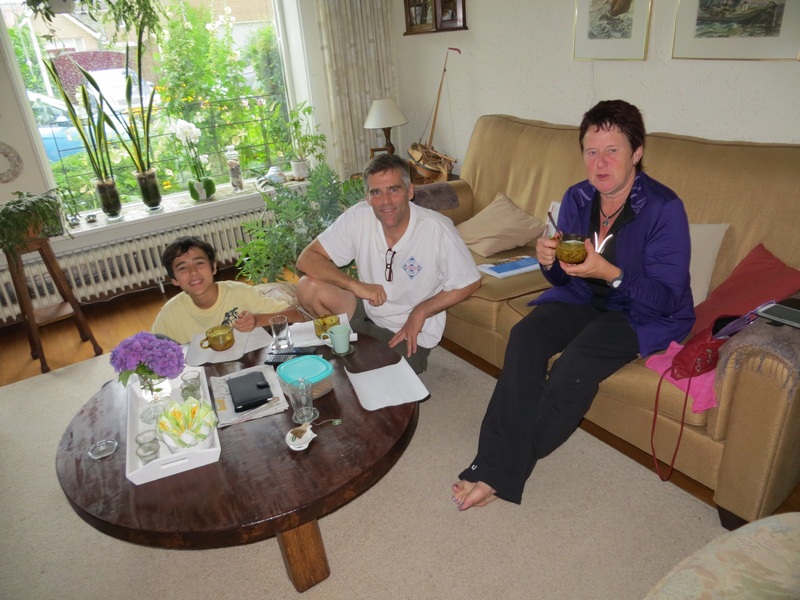 After our walk, we met friendly Mrs. deVries (the most common surname in Holland, she said) and settle in for the evening. Vrienden op de Fiets is a network of folks across Holland and Belgium mainly but also around the rest of Europe and the world, who offer a clean room, shower, storage for your bicycle, and a hearty breakfast for only 20 Euros per person. It’s a fantastic deal, especially in an expensive country like Holland, and much more interesting than a hotel, IMHO. Here was our cozy room at the deVries home. next…a morning walk in Amsterdam, and off to Amersfoort! In a few days, Dan and Keenan will be off to Europe. You can follow their madcap adventures here. If you came to this site via the DW Shumway author’s page on Facebook, or you followed the link on the back of my first book, click the books link above for more information.